Last time I talked about pKa and how it’s the closest thing we have to a universal measurement of the strengths of all kinds of different acids and bases. I also referred to a post on how to use a pKa table (key lesson: stronger acid plus stronger base gives weaker acid and weaker base). How far can we push this? Let’s look at three illustrative examples. On one extreme, we have one mole of a really strong acid – let’s say hydrochloric aid (HCl), pKa –8. And to it, we add (slowly!) a solution of water containing one mole of sodium hydroxide (the conjugate base of water, pKa 15.7). HCl and NaOH react to give water and NaCl . How favorable is this reaction? We can make a rough estimate. The pKa of HCl is -8. Sodium hydroxide is the conjugate base of H2O (pKa 15.7). That’s a difference of about 24 pKa units – and since each pKa unit represents one order of magnitude, this reaction is favorable with an equilibrium constant of about 10 to the power of 24. For all intents and purposes, a reaction with an equilibrium constant this huge is irreversible. That is to say that HCl and NaOH are completely consumed when they react together, giving only H2O and NaCl. What about the other extreme: the reaction of methanol (pKa of 15.2) with sodium hydroxide (the conjugate base of water, pKa 15.7)? Neither side of the acid-base reaction is strongly favored. Here we’re dealing with a very small difference in pKa – only 0.5 pKa units. So the equilibrium constant here would only be about 10 to the power of 0.5 —> 3.16 toward giving the weaker acid (water) and the weaker base (CH3O(–). At equilibrium we’d expect to have a mixture of about 75% CH3O(-) [the weaker base] and 25% HO(-) [the stronger base]. In other words, both species are present in solution. So how far can we stretch this? In between these two extremes, at what point does a reaction become irreversible for practical purposes? There’s no hard and fast rule on this. But for practical purposes, a good rule of thumb is about 10 pKa units. That is to say, if the difference in pKas between an acid and a base is about 10 pKa units or less, it is useful to consider their acid-base reaction to be in equilibrium. Think about what that means – a ratio of one molecule in 10 billion can make the difference in a reaction! One in 10 billion might not sound like a lot. But when you consider that a mole contains 10 to the power of 23 molecules, and each of them are colliding millions of times per second, the odds aren’t really as bad as they look. These reactions can happen. If your only chance of buying a private jet rested on you winning a Powerball lottery – but you were able to fill out hundreds of thousands of entries per second, every second, you’d be at the G5 dealer by next Tuesday. Here’s an example you’ll see in Org 2. 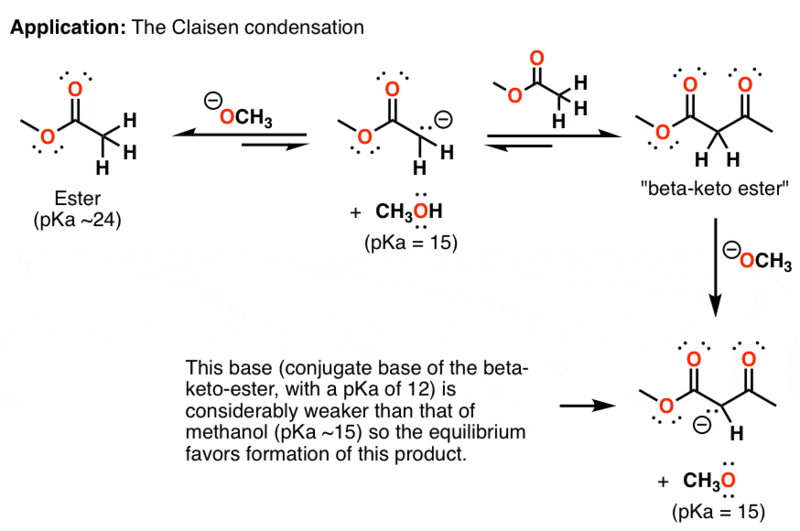 The Claisen condensation begins with the deprotonation of an ester (pKa ~24) by an alkoxide ion (conjugate base of an alcohol, pKa ~15). That’s disfavored by about 10 to the power of 9, since we’re going from a weaker base (alkoxide) to a stronger base (deprotonated ester, a.k.a ester enolate). Even though there’s only a small amount of the deprotonated ester present at equilibrium, this can be enough to get the reaction to go! You can take my word for it – that this rule of thumb applies – and leave it there. Or if you’d prefer to go through an actual application of this concept, I’ll finish up with that. Slightly advanced – an application of how this works. One application of this concept can be found in the Claisen condensation of esters. The Claisen condensation involves the addition of a deprotonated ester (an “enolate”) to another equivalent of an ester, through an addition-elimination reaction (more detail here and here). The first step is deprotonation of the ester by an alkoxide ion [in this case CH3O(-) ] as mentioned above. This enolate can then attack a second equivalent of ester, which then eliminates an equivalent of alkoxide ion. This reaction is also potentially reversible. However, the protons of the new product – a “beta-keto ester” – are considerably more acidic than those of the starting ester, and an acid-base reaction between it (pKa 12) and alkoxide (pKa 15) is quite favorable. 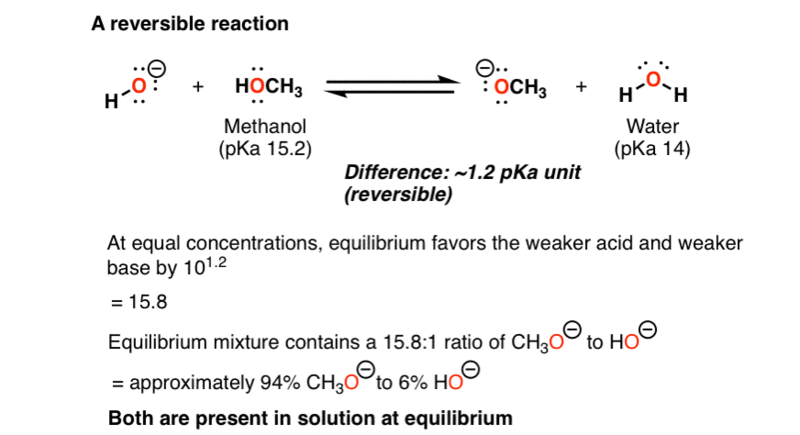 The equilibrium eventually favors the final product, because the conjugate base of the di-ester (pKa 12) is considerably weaker than methanol (pKa ~15). In other words, even though the first step is extremely disfavored, this is made up for by the fact that there is a very good “driving force” for the subsequent reaction. Thank you for this post it was very informative. One thing that I found lacking however was what happens, for example, if you did a 2:1 (not equal) methoxide/methanol to water solution? What ratio would you get then? I don’t think you could make a solution that concentrated. If you calculate the molarity of the “solution” formed by, say, starting with 1 L of methanol (791 g, or 24 moles) you would have to add you would have to add 48 moles of NaOMe (2.6 kg). I don’t think it can be done. I’m confused about the hydroxide-methanol reaction you gave. Since methanol is a weaker acid than water, shouldn’t methoxide be a stronger base than hydroxide? I seem to remember that alkoxides are stronger bases than hydroxides from my organic chemistry class. If you could please explain this, that would be great. Nevermind, I misread the pKas, sorry for the confusion. Dear James, thanks for posting but I still have some confusion. If strong acid and strong base react to give weak acid and weak base, how do you know which direction the equilibrium lies? In your first example, you have HCl (stronger acid) forming water (weaker acid). Couldn’t I just as easily say you have water (stronger base) and HCl (weaker base). That would imply that HCl formation is favored. Obviously, this is not true so what am I doing wrong here? Are there any general rules using pKa or pKb that help predict this? Thanks for any insights on this. Hi – the difference is that in the reverse direction, the identities of the “acid”, “base”, “conjugate acid” and “conjugate base” would switch. The conjugate acid (HCl, pKa -8) is clearly stronger than the acid (H2O, pKa 15). Therefore this reaction would not proceed. It’s easier to make the judgement call with pKas since those measurements are readily available. We don’t generally deal with pKb’s. Thanks for the response. If I understand correctly, HCl has lower pKa so its a strong acid meaning Cl- must be a weak conjugate base. H2O has higher pKa so its a weak acid meaning OH- must be a strong conjugate base. In your example, the strong acid and strong base are both on the reactant side of the equation while the weak acid and weak base are on the products side. And thermodynamics says the reaction equilibrium lies to the weak side? I had some confusion about the pKa’s of Methanol and Water… I expected the Methoxide ion to be more unstable than the Hydroxide ion. In water, Methanol is less acidic than water but in DMSO, its vice versa! NaOH is not the conjugate base of H2O. NaOH is not a Bronsted species at all. HO- is the conjugate base of H2O. In practice we label NaOH as a strong base. In fact it is a strong electrolyte and contains the strong base HO-. Rigorously, HO- is not a strong base, it is at the border between weak and strong bases. Let’s keep going down the pKa table, then. Terminal alkynes? Weak acids. Acetylide ions are strong bases. Secondary amines? Weak bronsted bases. Their conjugate bases are strong bases. Alkanes are extremely weak acids, alkyl anions are extremely weak bases. I can’t see how “the conjugate base of a weak acid is a weak base” holds up. Generally not practical for pKa difference of >10. Absolutely not practical for NaCl and CH4. We’re talking 55 orders of magnitude, at least. If you waited around from the beginning of the universe until today, you might see not even see it happen.